The story of little Mishu and her fun times with BSA Ladybird. BSA Ladybird gives your dreams wings on two wheels. With a BSA Ladybird by your side, every moment becomes joyous, exciting and amusing. Each ride is fun, comfortable and secure with the exciting new range of colourful and feature loaded bicycles. These bicycles enable you to explore the world fearlessly with confidence. Say hello to your new best friend because fun times begin with BSA Ladybird. [value] => Girls Bikes - Make your life more joyful with a new range of colourful BSA Ladybird bicycle ride. Buy Affordable, comfortable and fashionable bicycles for girls. Turn a new leaf in your quest for fun and fitness, by turning your daily life into delightful adventures. The all-new Mach City blends design and performance seamlessly, for an unmatched riding experience. With contemporary designs and colours that capture your personality, the Mach City is more than just a bike - it’s an extension of who you are and what you’re about. Breathe life into your old routine by rediscovering cycling with Mach City. [value] => Explore and buy your favorite Mach city bicycle to re-discover your city at the best prices and with low maintenance. Buy Mach City ibike for the best experience. In 2011, TI Cycles of India launched its very own performance bicycle brand Montra. Montra is the first high end performance bikes designed and manufactured in India. The Montra range of high-end bicycles is created on par with international performance biking standards. Montra was the first to give our country its first indigenously designed and manufactured carbon frame bike, the Montra Techno. In early 2012, Montra launched India’s first titanium bike in the Country, the Montra Country Titanium. If you are looking for bike for your daily commute or urban riding, the Montra Blues series will suit your need. The MTB series, the Montra Rock is best suited if you are looking to experience a thrilling trail ride. Montra is TI Cycles answer to bringing high-end performance bikes to Indian riders at an affordable price. [value] => Check out a range of Montra bicycles and bikes from Track and Trail. Buy the best high-end performance road, hybrid, mountain, kids geared bikes and bicycles in India. Whether it is the peak of adventure or a slope of thrill, this incarnation of Hercules will turn heads and steal hearts. Aimed at boys and teenagers who flaunt their skills, Hercules Roadeo is ideal for the bold and fearless trendsetter. 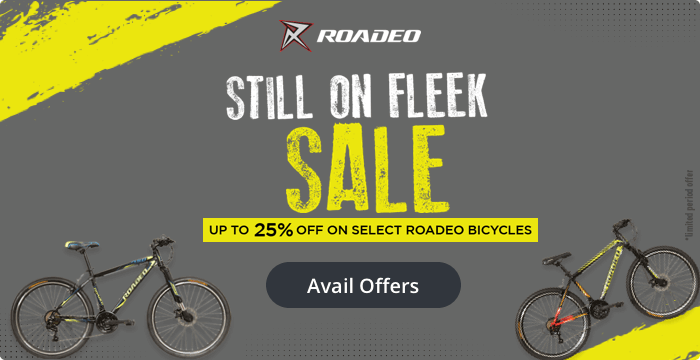 Roadeo’s range of bikes boasts stylish steel and alloy designer frames with full suspension and internationally acclaimed Shimano gears. 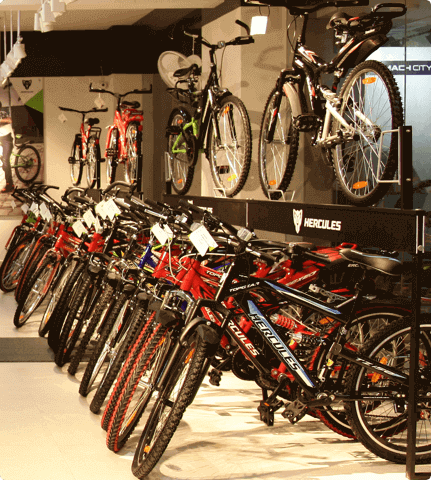 [value] => Explore the wide range of Hercules Roadeo bikes and bicycles for boys and teenagers. View price, models, specifications, colors online. Buy Roadeo at the best price.